"A model reference work that can be used with profit and delight by general readers as well as by more advanced students of Twain. Highly recommended." 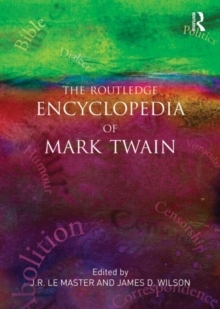 - Library JournalThe Routledge Encyclopedia of Mark Twain includes more than 700 alphabetically arranged entries that cover a full variety of topics on this major American writer's life, intellectual milieu, literary career, and achievements. Because so much of Twain's travel narratives, essays, letters, sketches, autobiography, journalism and fiction reflect his personal experience, particular attention is given to the delicate relationship between art and life, between artistic interpretations and their factual source. This comprehensive resource includes information on:Twain's life and times: the author's childhood in Missouri and apprenticeship as a riverboat pilot, early career as a journalist in the West, world travels, friendships with well-known figures, reading and education, family life and career Complete Works: including novels, travel narratives, short stories, sketches, burlesques, and essays Significant characters, places, and landmarksRecurring concerns, themes or concepts: such as humor, language; race, war, religion, politics, imperialism, art and science Twain's sources and influences. Useful for students, researchers, librarians and teachers, this volume features a chronology, a special appendix section tracking the poet's genealogy, and a thorough index. Each entry also includes a bibliography for further study.